Your "must read" guide to all the steps involved in creating a guided meditation, from script to CD and beyond. Read on as The Guided Meditation Site's founder, Dr. Christopher Lloyd Clarke, shares his expertise with you. In this series of helpful articles you'll learn everything you need to know about creating a guided meditation that you'll be proud of. Along the way, you'll discover tips that will save you time and money when it comes to recording your guided meditation. Last but not least, this information will help you to avoid common problems so that you can relax and enjoy the the experience of creating a top quality guided meditation that people will really love. 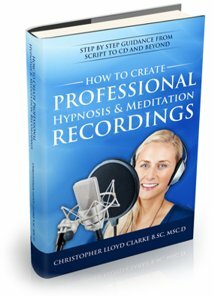 If you want to create a meditation or hypnosis recording then you really must get your hands on this free ebook from Enlightened Audio.com. Written in a friendly and easy to read style, this 110 page ebook is the definitive guide for every therapist and healer. To get your free copy, simply click here to visit the Enlightened Audio Learning Center and follow the link to How to Create Hypnosis & Meditation Recordings. Your guided meditation will probably start its life as a written script. In this article, we go deep into the subject of script writing for guided meditations and cover some essential do's and don'ts. These lifesaving tips are bound to save you from a few headaches, and they will certainly help you reach more people with your work. A great guided meditation needs great background music to go with it. In this article you'll discover the two most popular ways of acquiring guided meditation music, and I'll explain the pros and cons of each. This is a "must read" article if you want to make sure that your guided meditation comes together smoothly. In this article you’ll discover some excellent tips on how to record your voiceover, from selecting a recording studio to voiceover techniques, and some links to free audio recording software for those of you who are keen to record yourself. I’ve also included some tips on how to really save on studio recording costs. Whether you intend to sell CD’s or MP3 downloads, you’ll need some beautiful graphics to publish. In this article I’ll show you how to get your hands on the graphics you need. There are some very simple time saving and cost saving ideas in this article! If you have created a guided meditation recording, then it's only natural that you will want to protect it from copyright infringement. Copyright law is probably a lot simpler than you think, as this article explains. Fines for copyright infringement can be financially devastating, so if you have created a guided meditation, hypnosis or any other type of recording, then it's extremely important that you go through this checklist to ensure that you are "in the clear". With digital downloads on the increase and CD sales rapidly declining, now is the time to sell your guided meditation download online. It's really very cheap and very easy to do once you know how.